Subaru is celebrating 50 years in the U.S., and they aren’t done with the party yet. There are two new models coming in 2018. In addition to the all-new Ascent 3-Row family hauler, the Limited Edition 2018 Subaru WRX STI RA and Limited Edition 2018 Subaru BRZ tS, there are two new model launches coming this year. 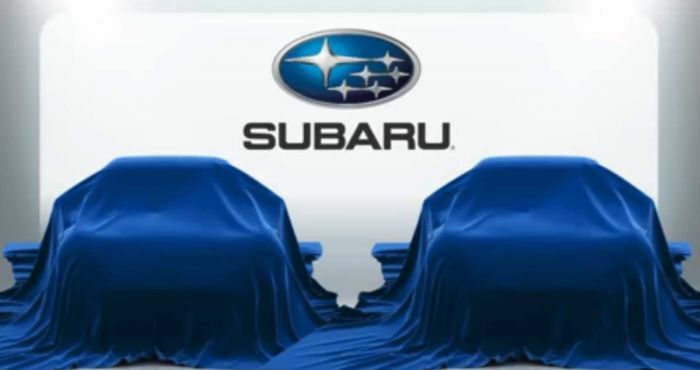 At the Chicago Auto Show, Tom Doll COO Subaru of America announced there would be more new product announcements in the next few weeks. He showed a picture of two new models hidden under cover. We know of one new model launch, and we’ve got a good idea of what the second model will be. We know a new Subaru Hybrid will launch later this year. The last Subaru Hybrid was the Crosstrek hybrid and was discontinued in late 2016. Subaru Corporation introduced a 2017 Crosstrek Hybrid tS in Japan upgraded by Subaru Tecnica International. This model won’t ever reach U.S. shores, but it’s Subaru’s plan to introduce more STI-enhanced models like the Crosstrek Hybrid tS in the future. Subaru hasn’t confirmed the new Hybrid model will be the Crosstrek, but it’s likely the model to get the new powertrain with the newest hybrid technology. Subaru chief technical officer, Takeshi Tachimori says, Subaru’s new plug-in hybrid will pull largely from the Toyota Prius Prime's system. Toyota owns 16.5 percent of Subaru, so this would make sense from a business standpoint for both Japanese automakers. Subaru will launch a new hybrid model in the U.S. later this year and is using Toyota technology to do it. ”For our plug-in hybrid to be introduced this year, we have used Toyota's technologies as much as possible," Tachimori said. The Subaru Forester will be the next model in the brand’s stable to get the new Subaru Global Platform. 5-year Subaru’s 5-year life-cycle, the Forester SUV is next in line. The fourth-generation Subaru Forester, introduced in 2013 as a 2014 model, is showing its age and it’s ready for a complete remodel. The all-new fifth-generation 2019 Subaru Forester will arrive in October 2018. It’s going to be a big year for Subaru of America, and they aren’t done celebrating yet. Subaru is expecting to finish 2018 with another new record and have their 10th consecutive year of record sales. Subaru of America is projecting 680,000 sales up 5 percent over 2017. Look for a new Hybrid model and the next-generation 2019 Subaru Forester to be announced soon as they continue the party. The new Forester show at the Geneve 2018?